A number of years ago, I ran across a story involving two mice. They were each a part of an experiment. The first was put in a windowless room which allowed no light, leaving the room pitch black. The mouse was then dropped into a tub of water, where it struggled to swim and eventually drowned in three minutes. The second mouse was put in the exact same environment, the only difference being that those conducting the experiment let in a small sliver of light. To the astonishment of those conducting the study, the mouse was still swimming after 36 hours! How could one mouse swim for so long? I believe it has everything to do with hope. 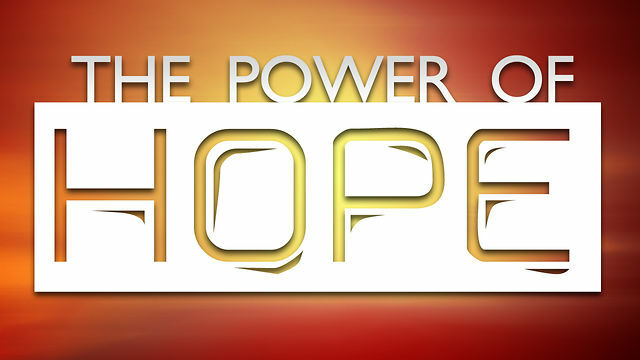 Hope is one of the most powerful words in the English language. Hope elicits a response. Think of the message that President Obama first ran on, “Hope and Change”. Our nation was, and I believe, still is looking for hope. The problem is that we often look in the wrong places. In John 9:5, Jesus said, “While I am in the world, I am the Light of the world.” Since Jesus has physically left the earth, we are now the light-bearers. He is to reside in us, and as a result, shines through us. I write this because I have faced some enormous difficulties in this last couple of years, but the hope of Christ has carried me through every season. I am heart-broken for my family members, friends and others who do not have this hope. I wonder at times how the darkness does not lead them to despair. Paul says in 1 Corinthians 15:19, “If only for this life we have hope in Christ, we are of all people most to be pitied.” My hope in Christ carries me beyond my despair. He is the one who shines His light into the darkest recesses of my heart. It’s because I know He has more for me that I continue to fight. Today, be encouraged. Hope in God! Know that you can go on, no matter what you’re facing, and He’ll meet your every need. Share that hope with others. Be a light-bearer and rejoice in God’s faithfulness! For our hope can never be taken!! For more tips and games, subscribe to our blog and follow us on Twitter @stumingames.